Are you tired of the same ole out there when looking into your next truck? We are too! Coming to YOU Spring 2019 is the all new 2019 Ram 3500! Get excited folks. This truck has more power than ever before while maintaining its sleek, rugged exterior. CAPABILITY: We didn’t think we could make the Ram tow anywhere than it already could! But we have outdone ourselves this time. 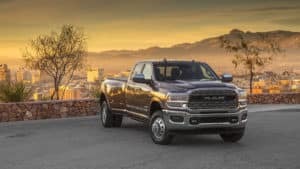 The all new 2019 Ram 3500 can now tow up to 35,100 pounds. Yup, that is right! The 3500 Ram is making it easier to tow things as well. Comes with a 360 Surround View Camera and Trailer Reverse Guide. The Camera uses five different views to provide you a complete picture of the truck’s surroundings additionally to help you align your truck to your trailer. The Ram 3500 also has “Trailer Tire Pressure” monitoring, this system displays live pressure readings for up to four trailers and up to 12 tires pre trailer. With a tow of 35,100 you would think the payload would be great right? Correct! The payload on the 2019 Ram 3500 is up to 7,680. The 2019 Ram 3500 now also has the option for you to pick which legendary engine you desire based on your needs. SAFE & SECURE: We know this truck is all about the muscle but our goal is to keep you safe. The Forward Collision Warning with active braking helps warn the driver when an accident is imminent. If you, the driver, takes no action it will automatically apply the brakes to come to a complete stop no matter what you are hauling. The 2019 Ram 3500 also comes with adaptive forward lighting system this lamp turns up to 15 degrees to increase your nighttime visibility. One other main feature is the Adaptive Cruise Control, will help you maintain a set distance with the car in front of you. When slower traffic is detected the truck will automatically adjust its speed all the way down to 0 mph. Other awesome features include but not limited to are blind spot monitoring, parksense front & rear park assist, and so much more! INTERIOR: We know the 2019 Ram 3500 looks real rugged but don’t let that fool you – this is a luxurious beast on the inside! The interior now has even more leather and real wood interior coverage than any other trucks on the market.